Whether it’s your home, church, or place of business, the one part of your building you want to make sure is in excellent condition is your roof. However, many people overlook this, and that’s a mistake. Before you know it, the next rainstorm has your roof leaking, and you find yourself in need of help. That’s where we at Janney Roofing can help. With more than 40 years of experience, we can give your building a roof that will last for years and years. 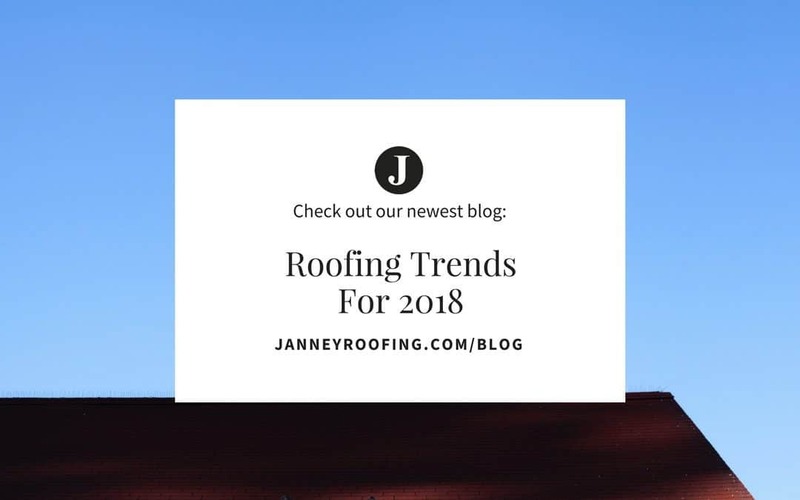 If you’re thinking about replacing your roof in 2018, here are some of the top roofing trends to consider. Whether you have a residence or commercial building, one of the biggest trends many Orlando roofing companies have noticed in recent years is the demand for colored roofs, and that trend is expected to grow even more in 2018. A great way to compliment your home’s exterior, a colored roof can make a beautiful building look even better. For best results, colors such as dark blue, gray, or deep green are recommended. If you’re looking for colors that provide a neutral tone, gray and dark blue are recommended. However, if you’re wanting a color that looks very natural and blends in well with your surroundings, deep green is a great choice. For many Orlando roofers, they’re finding more and more customers are wanting roofs which are environmentally-friendly. As a result, licensed roofers in Orlando now look to use roofing materials which are recycled from a variety of sources, with one of the most popular being tires. Considered very environmentally-friendly, these roofs are also very affordable for virtually any building, are resistant to hail, and guaranteed to never crack. A popular roofing trend for several years, Orlando roofers expect to install more metal roofs than ever in 2018. While once seen only on commercial buildings, metal roofs can now be found on many residential properties, as well as churches and other buildings. Available in almost any color, these roofs are extremely strong and durable, and are also looked at as very environmentally-friendly. While costing a bit more than traditional shingle roofing, metal roofs more than make up for the added cost with their strength and durability. In fact, most metal roofs can last between 40-60 years, often looking as good as they did the first day they were installed. If you’re ready to give your building a great new look by adding a new roof, then contact us here at Janney Roofing. Family-owned and operated Orlando roofers, we treat each and every roof as if it were our own. With our commitment to honesty, integrity, and quality, you can be sure we will do the job right the first time. To contact us, give us a call at 321-385-ROOF (7663) or send us an email at [email protected], and we’ll get in touch with you to discuss your building’s needs. Remember, if you want the best, you want Janney.